For those who frequented or who actually lived in the house, just the name "Seventy Six" or "Station Road," as it was known , will conjure up a myriad of phantasmagorical memories and a kaleidoscope of events and crazy situations peppered with some of the most characterful personalities that in normal everyday life one is "unlikely" to ever meet! The house was rented in 1972 and I moved in during 1973 at the age of 21. The house saw a slow but ever evolving change in residents throughout it's "era" which lasted in the region of ten years, where eventually the owner paid out to regain "vacant possession". They say that life often goes in seven year cycles (I lived there for seven years) and the heyday of the house really lasted around that length of time and what a period that was! Invariably constantly visited and often with a smokey atmosphere of an on going party who's cadence calmed when people eventually hit the sack at six in the morning and tranquillity reigned until they resurfaced in the early afternoon. From the free jukebox in the kitchen to the powerful stereos in each bedroom the house was regularly throbbing, often causing terse looks from our neighbours who rarely complained. Amongst all these festivities hid a strong creative spirit in many fields from some of the residents, Peter Rostgaard (who sadly died in 2010) was a "practising historian" in the field of valve electronics and was constantly creating electronic projects as well as doing the odd disco with his remarkable sound system. Keith Church who was so tragically murdered in a midnight street knifing attack (this event weighs heavily on all who knew him) was a talented artist. 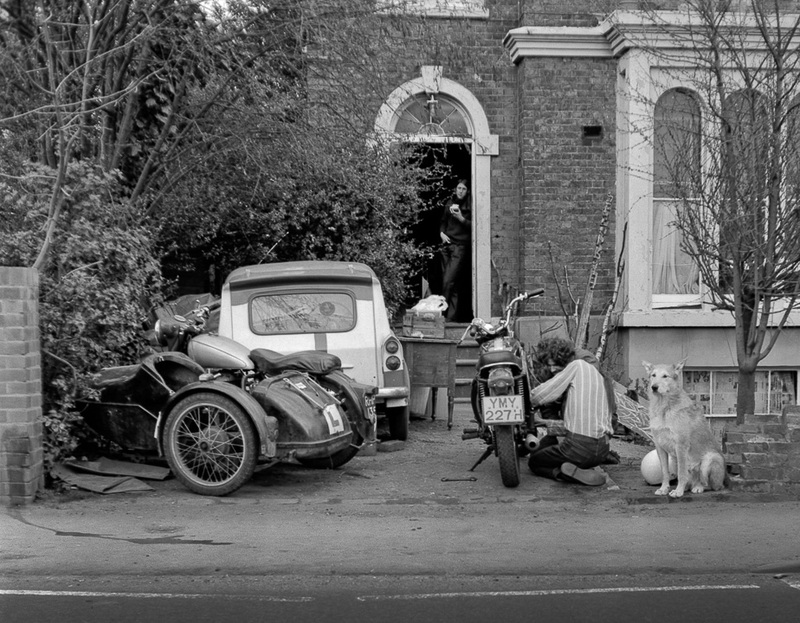 A strong interest in British motorcycles also prevailed and, as can be seen from a couple of photos, they often dominated the hallway and kitchen, the bikes of Ian, myself and Graham. Luckily, the household had a strong interest in photography (Pete, Paul, myself) and it is here today that we can remind ourselves of some of the characters and scenes from that special period. Sadly the best of my photos were lost in a series of house moves but Paul and I scanned the remainder and they are presented here as "Out and About," "Station Road" and a series of photos from the wonderful summer of 1976 spent in Perranporth, "Cornwall 1976". Paul presents his own valuable contribution with his fine photos in "B&W", "House" and "Colour". I would also like to thank Paul for his efforts in creating the website.